Shambra Restaurant Consulting recently completed work on the newly-launched Bottlefish restaurant. The brainchild of Rick Rosen and Larry Flax, the founders of CPK, the restaurant opened last week on the second level of the Brentwood Gardens complex located at 11677 San Vicente Boulevard. The restaurant features a display kitchen with full view of the 25-foot custom-made stainless steel chef's counter, as well as a separate raw bar display window. 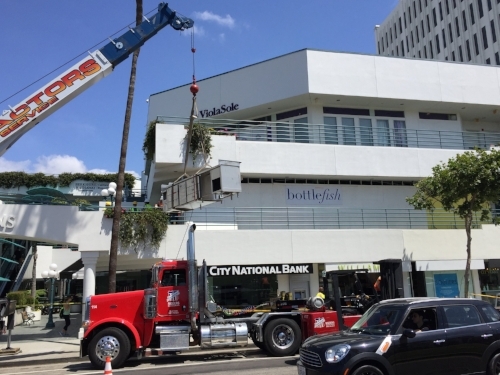 To transport and install the counter, Shambra Restaurant Consulting hired a crane and a flatbed trailer to haul it on site and lift it to the second level. SRC wishes the best of luck to Bottlefish!